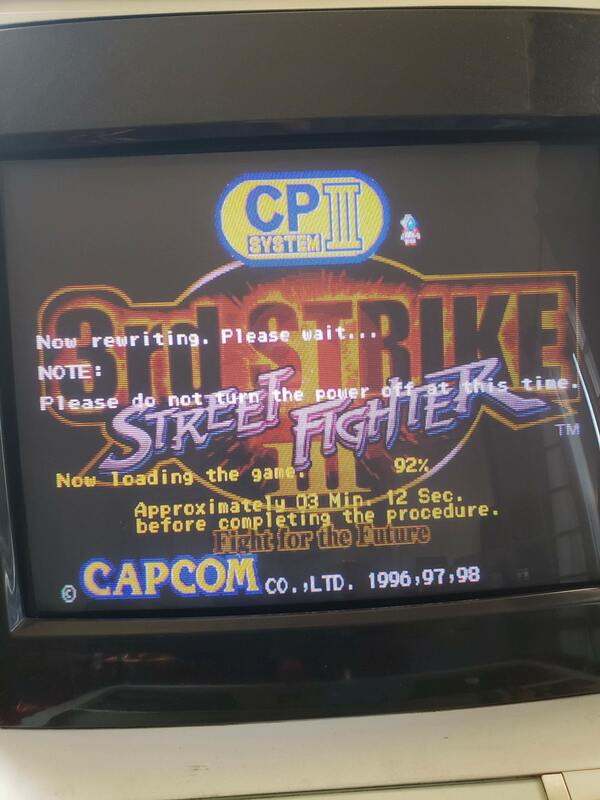 Ok, so I've successfully written 3S to my memory before, and played the game to see it working on my supergun setup. Since then I've had to rewrite the game, and I'm getting new errors/things now. I'm installing it in my Astro cabinet. My CPSIII setup is OG memory, all six simms. OG CD drive as well, but burned CD and then Darksoft cart. 1. Tried writing 2nd Impact to the memory 3 times. My board was originally 2nd Impact, so I was advised to write that game first, completely, then do 3S afterwards. All three times I got "ERROR 21" towards the very end of the write. Is there a manual or table listing these error codes? 2. Tried writing just 3S on its own twice. First time it hung at around the 3 minute mark, and I turned it off after waiting about 45 minutes. Before writing 3S the second time, I used the Darksoft menu to erase each of the simms. Second time 3S actually finished writing! The game booted and the attract loop started playing. When I pressed start (no coins in, duhhh), the game froze. After powering off, then on again I was seeing the "you have inserted a new CD" message again. Reseated all the simms and the Darksoft cart. 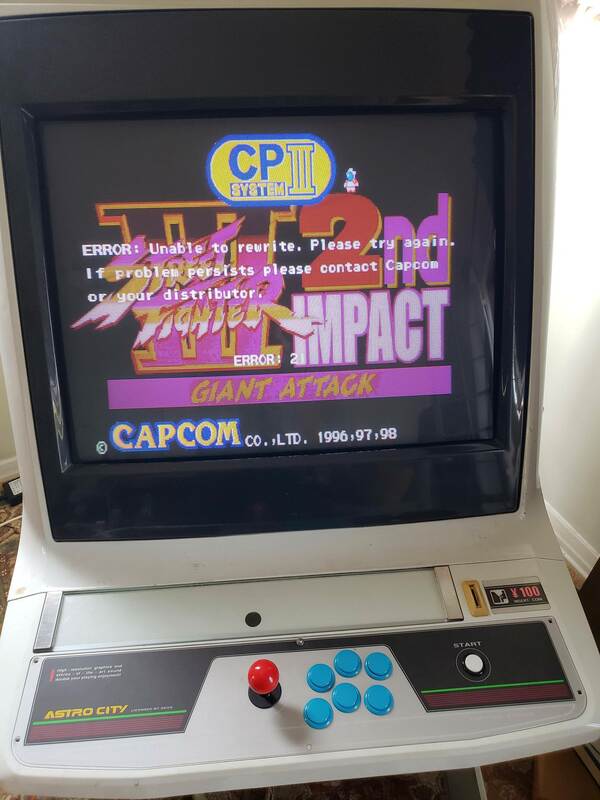 2nd Impact again gave me "ERROR 21," and 3rd Strike is once again stuck right here. The last number refers to the simm slot. So check simm slot 1. Clean the contacts of the sim with a q-tip and 91% Isopropyl Alcohol. If it still doesn't work swap simm 1 and 2 around and see if you get a different error code (error 22). If you do get a new error code, then the 64MB simm is bad. I swapped simms one and two, got error 21 again. So the slot is bad? The burn was already done at a decently slow speed for modern drives (10x?) and I think it's Verbatim. I'll check. I also have the SCSI pcb that replaces the drive, as soon as I can get that running I'll try it as well. It did exactly the same as yours, it was working, froze up and died, rewrite and it loaded completely but then wouldn't run properly and now just consistent errors. How do you guys recommend cleaning the slots themselves?